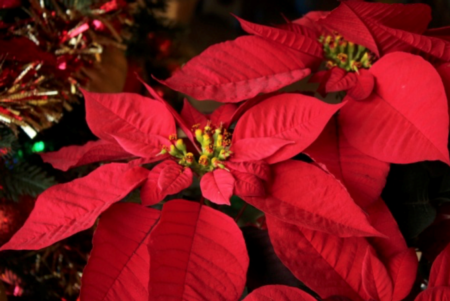 The plant we know today as the poinsettia has a long and interesting history. Native to Central America, the plant flourished in an area of Southern Mexico known as Taxco del Alarcon. The Aztecs used the plant for decorative purposes but also put the plant to practical use. They extracted a purplish dye for use in textiles and cosmetics from the plant’s bracts. The milky white sap, today called latex, was made into a preparation to treat fevers. The poinsettia is named after Joel Robert Poinsett, the first ambassador to Mexico and a passionate amateur botanist. One December, Poinsett discovered the beautiful red, tall and scraggly plant blooming in the region near Taxco, Mexico and had some of the poinsettia plants sent to his plantation in South Carolina. Paul Ecke, Sr., and his dad Albert, however, were the first to promote poinsettias as a winter holiday flower over 80 years ago. They cultivated the plant on their ranch near Hollywood and sold the blooms from roadside stands in Hollywood and Beverly Hills. The company is still one of the largest poinsettia growers. The Poinsettia in now the number one flowering potted plant sold in the USA even though it is only sold for two months of the year. Poinsettia is a member of the genus Euphorbia. The red bracts, or modified leaves, are not the petals of a blossom. The single female flower is petal-less and surrounded by male flowers in a cup-shaped cyathium in the center of the bracts. It has the milky white sap or latex associated with the family Euphorbiaceae, but unlike some members of that family it is not poisonous. This misconception grew from the misdiagnosis of the poisoning of a small child in Texas in 1919. According to Poisindex Information a 50-pound child would have to ingest over 500 bracts to even get a stomach ache, besides the taste is reported to be really awful. Some people sensitive to the plant might develop a rash. When you buy your poinsettia this year, here is how to select a good one. Examine the cyathia, the little yellow or green berries in the center of the bracts. If they are tight, the plant is fresh. Choose stiff stems and good bract retention. Be wary of plants displayed in paper or other sleeves and crowded together. They need space, and crowding can cause problems. Poinsettias will wilt if exposed, even briefly, to temperatures below 50 degrees. Select plants with stiff stems, good bract and leaf retention, and no signs or wilting, breaking or drooping. Examine the soil of the plant. It is best to avoid waterlogged soil, particularly if the plant appears wilted. This could be a sign of root rot. Keep plants indoors at 68 to70 degrees and place in indirect sunlight for at least six hours a day. Don’t over water. According to the Paul Ecke Ranch in southern California that has been researching, breeding and selling poinsettias for over 75 years, you should water when the soil feels dry to the touch and fertilize after the blooming season with a balanced all-purpose fertilizer. Don’t over water and don’t fertilize when in bloom. With proper care, dedication and luck, you can re-bloom this year’s poinsettia. In late March or early April, cut it back to eight inches and place in a warm, but shady place. Water it regularly and feed with a balanced fertilizer to see new growth by the end of May. In the summer, repot in new soil that includes sand and peat moss. When there is no chance of frost, place outside in full sun and keep soil evenly moist and feed every two to three weeks. Poinsettias are photoperiodic, so beginning on the first of October, plants must be kept in total darkness for 14 continuous hours each night at 68 to 70 degrees of temperature. During the day they need 6-8 hours of sunshine. Continue to give regular water and feedings for the next 8-10 weeks to get blooms for the holiday.